Utelogy is a flexible single platform solution for Smart Classrooms, Auditoriums, Theaters, Telepresence and Collaboration Systems. The importance of effective communication technology in the classroom and virtual classroom has intensified in recent years. Today’s students expect a multimedia educational experience. This, plus the availability of new technologies has put pressure on campus AV teams to upgrade the systems in their classrooms and lecture halls. The rapid growth of distance learning has also put demand on AV capabilities. To remain competitive, schools need a cost-effective way to enhance the communication tools they provide to faculty and students. Utelogy’s software-defined approach to AV control and management enables colleges and universities to deliver the right presentation and collaboration tools at significantly lower cost. Utelogy enables easy integration with any web-enabled AV device from any manufacturer, allowing you to select the right component for the job at the right price for the budget, regardless of the manufacturer. Utelogy can run on any network and any server, virtual or otherwise. This eliminates the need to purchase additional hardware while enabling faster implementation, better scalability, easier support and less down time, all of which deliver significant cost savings over proprietary systems. Lower upfront costs – Utelogy’s revolutionary approach to AV eliminates the need for large up-front hardware expenditure because it uses existing network infrastructure, providing a budget-friendly solution. Fast implementation – Utelogy connects to the existing campus IT network and uses the same interfaces the AV team already knows, so implementation and adoption is smooth and quick. On-demand scalability – Utelogy enables “Just-in-time AV”, allowing deployment of technology when and where it’s needed. Adding or replacing individual components or entire rooms is easy, quick and cost-efficient. ​Reduced support costs – Utelogy enables remote configuration, assessment and trouble-shooting, so fewer technicians can support more rooms with greater efficiency. Happy faculty members – Utelogy’s control interface is designed with the user in mind and can be customized by the user, with access from any tablet, PC or smartphone. Faculty can control rooms as they are comfortable. Better management decisions – Utelogy delivers metrics, analytics and other insights that drive management decisions, including return on investment, cost of ownership, usage and operational health. The right technology mix – Utelogy allows rooms to be modified quickly and cheaply, enabling cost-effective concept testing and fast, affordable implementation of new component mixes as educational needs and technologies advance. Configuring with Utelogy is where we really saved time and money, because it's roughly $1000 a room for coding and programming. But the other valuable benefit is that the Utelogy platform allowed us to easily experiment with the configuration that we ultimately deployed and I like having that flexibility. It allows us to deliver better utilization of classroom real estate and understand how many students were being served by that technology. 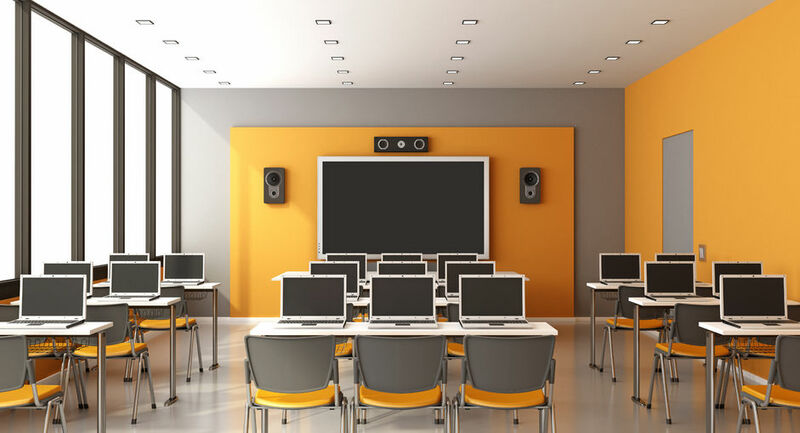 Whether your school is looking at classroom technology solutions for campus expansion or to replace outdated technology, Utelogy will enable you to deliver more to your faculty and students at lower costs. Learn more about the Utelogy platform.